When you think about door hardware you usually think about hinges and door knob sets. 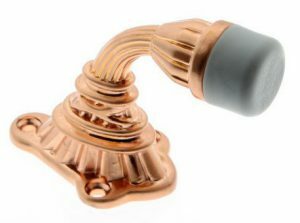 But, there is another hardware item for the door that can not only keep your door and walls from getting scuffed up, but is a pretty dapper design accessory. That is the door stop. 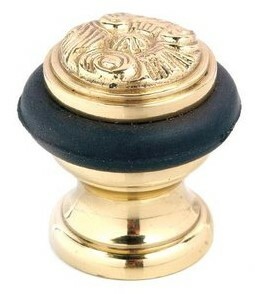 Door stops used to mean that brownish rubber wedge you jammed under the door to keep it in place or the funny spring that came out of the wall that kept the door from banging against the wall. Those options are still available, but door stops have become a pretty design element as well. The spring style and solid baseboard door stops are still a standard for many doors. They are economical and functional and will stop the door before the knob hits the wall and leaving a hole or mark on the wall. Today, the Wall Mount door stop comes in both metal and wood and in a number of period styles to match your decor. The Floor Mount Door Stop is another popular option. 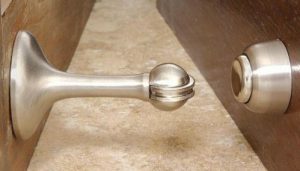 From a round, ornate stop with rubber bumper guard to a raised stop with single tip bumper guard, floor mount doors stops come in many finishes and styles. Hook Door Stops are anoth er type of floor mount unit that includes a hook and eyelet for securing the door in place. It not only keeps the door from opening to far but keeps the door open. The Adjustable Hinge Pin Door Stop mounts to a 3/16” door hinge and prevents the door from opening past a predetermined point. This style door stop will not work on all doors and is best suited for lightweight doors. The Drop-Down Door Stop mounts to the door and has a pivoting leg that folds down like a bicycle kickstand to hold the door in place. A rubber tip on the end of the leg keeps the leg from scratching the floor. This style door stop keeps doors open rather than preventing it from opening too far. Because it is attached to the door, it also prevents trip hazards. 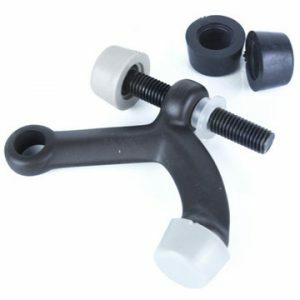 The Wall Bumper Door Stop is a bumper that attaches to the wall at door knob height to keep the door knob from hitting the wall. This type of door stop is often used in commercial buildings and offices. Another unique design is the Round Magnetic Door Holder. This features a long shaft that mounts to the wall or floor and a magnetic disk th at mounts to the door. The magnetized disk is drawn to the metal shaft to keep the door from closing. Door Wedges, like the name implies, are used to keep a door from moving. 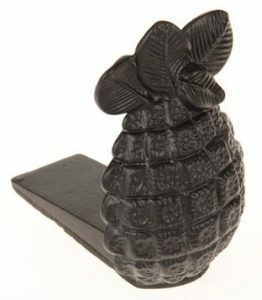 From a fleur-de-lis design to a whimsical pineapple shape, the door wedge style door stop has come a long way from the rubber wedge. 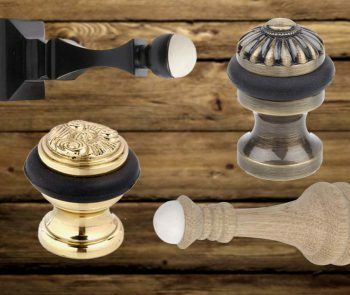 With dozens of shapes and styles of door stops, Van Dyke’s has just the stop for any application.